Niagara Falls is one of those tourist destinations that children in the United States learn about in school. Growing up, I read historical accounts of adventurous people going over the falls in wooden barrels and suicidal people ending their life by leaping into the mist below. Because of these tales of danger and demise, the falls were always fascinating to me. But I grew up in the southwestern part of the United States, nearly 2,000 miles from Niagara Falls. I told myself I would go someday, but it wasn’t until I was an adult that I finally made the trek. 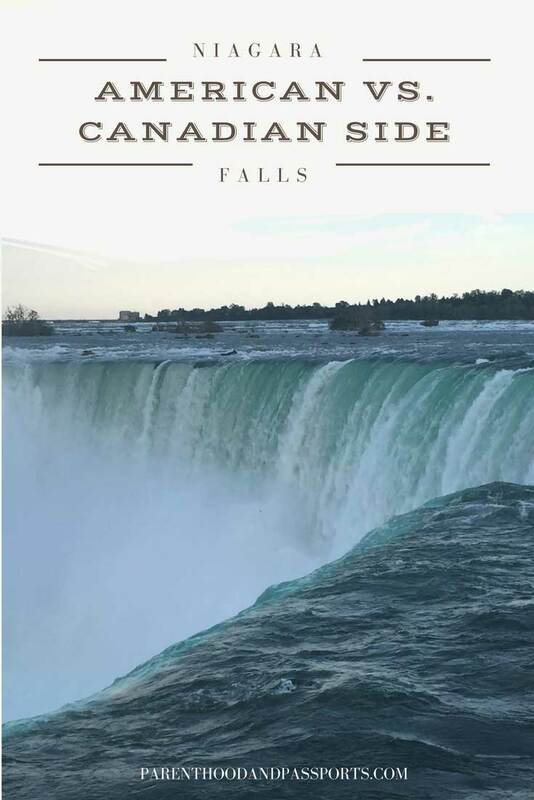 I was traveling solo, and wanted to check out both Niagara Falls American side and Canadian side. Luckily, you can easily see and experience both sides of Niagara Falls in one day. Niagara Falls straddles the border between the United States and Canada. You can view the waterfalls from either country, although the vantage points are vastly different. 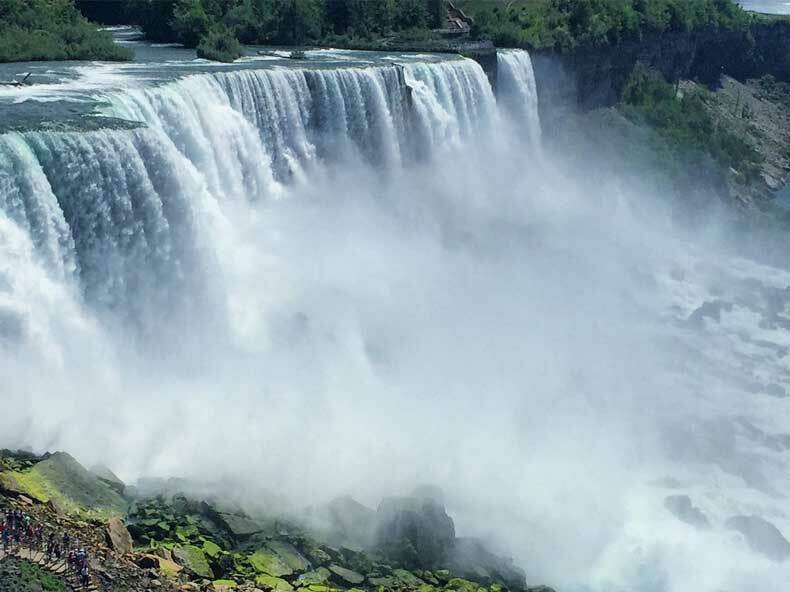 Most people who visit Niagara Falls arrive via Buffalo, New York. Buffalo is roughly a 30-minute drive away from the tourist attraction. There are numerous road signs leading from the airport to Niagara Falls. You don’t even need a GPS. Crossing the border from the United States to Canada is relatively quick and easy at this checkpoint. There were two tolls I paid to get to the border that cost a whopping $4.50 combined. There is no entrance or exit fee at the border. And on the way back to the USA from Canada, I only had to pay one of the tolls, which only cost $1.00US. The tolls were cash only unless you had a toll pass. Also, don’t forget your passport! You will need a passport even if you just plan to cross the border for a few hours to visit the Canadian side of Niagara Falls. I started on the American side of Niagara Falls. I paid my $10 to park, and made my way to the iconic waterfalls. The American side, however, was a bit disappointing. The area surrounding the waterfalls leaves a lot to be desired. It appears run down and poorly laid out. This became even more obvious the minute I crossed into Canada. It is a night and day difference! Still, there are definitely a few advantages to visiting Niagara Falls on the American side. From the American side, you can get much closer to the water than you can from the Canadian side. On the American side they offer two popular tours. The Cave of the Winds allows you to climb a walkway right up next to the American Falls. I did not actually do this, but I have heard from those who have that the wind feels like you are in a category one hurricane when you are standing next to the falls. Even though it is called The Cave of the Winds, you do not actually go into a cave behind the falls. 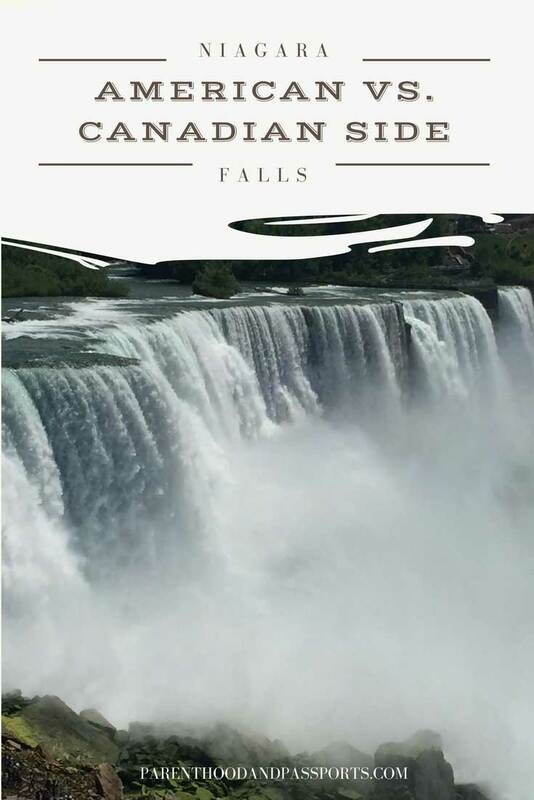 Instead, it takes you to an area between the American and Canadian falls where you can climb a short stairway to stand next to the Bridal Veil Falls. The Bridal Veil Falls are much smaller waterfalls that can almost be mistaken for part of the larger adjacent American Falls. This activity takes you so close to the waterfall that you will get wet. The cascading water actually runs under the platform you are standing on. No change of clothes is needed though. They give you a poncho that covers you head to toe. This activity can only be done from the American side of Niagara Falls. I would have felt comfortable taking my toddler on this boat ride, although I would have stayed on the lower level of the double-decker boat and avoided standing too close to the side where the mist is most intense. As with The Cave of the Winds tour, they give you a poncho that keeps your clothing dry. They also have smaller ones for children. 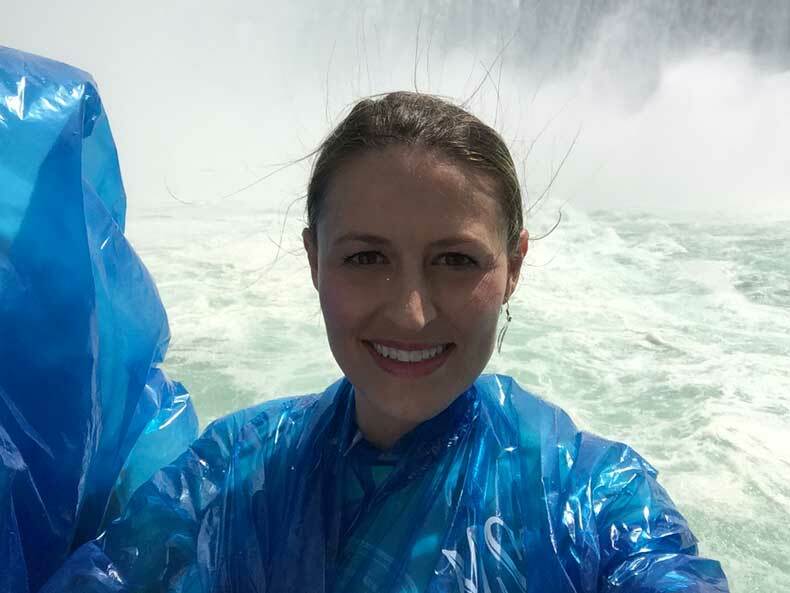 Before going to Niagara Falls, I had heard the Maid of the Mist was a great experience but it far exceeded my expectations. It is truly the best way to experience this powerful wonder of water! If you do the Maid of the Mist tour on the American side, once you exit the boat you can walk up a short staircase to stand next to the American Falls at no additional cost. It’s a great photo opportunity, a quick climb, and if you aren’t going to do the Cave of the Winds tour, then this will be the closest you can actually stand to the falls. This option is not available on the Canadian side. Niagara Falls’ Canada side offers you a view of the falls that you simply cannot get from The United States. You can get much closer to the Horseshoe Falls from the Canada side. 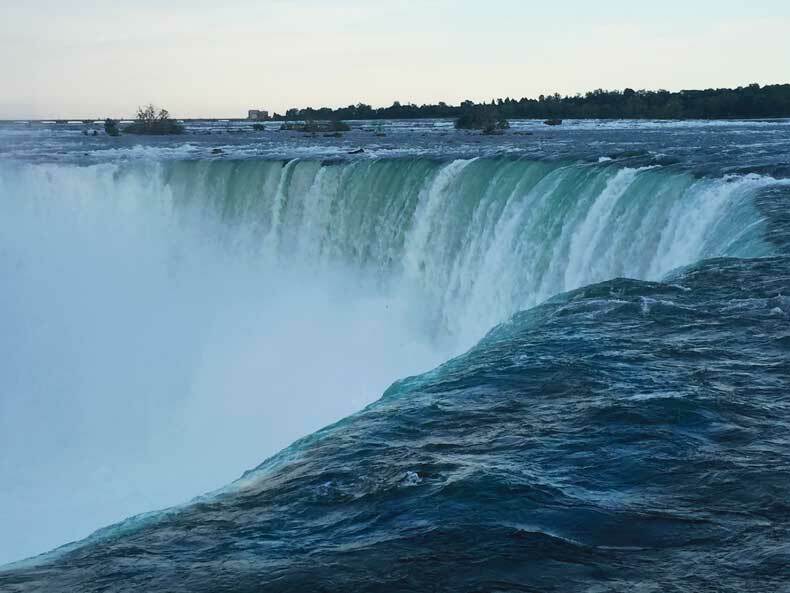 The Horseshoe Falls are the largest, prettiest, and most powerful of the three waterfalls that make up Niagara Falls. At night, the falls are illuminated in a rainbow of colors which can truly only be experienced from the Canada side of Niagara Falls. The Maid of the Mist boat tour also operates on the Canada side. So as I said earlier, you can experience it from either country. Besides the spectacular views, where Canada really wins this competition is in the atmosphere. Granted, it is completely touristy, and I realize some people are turned off by that. There is a Hard Rock Cafe, a Starbucks on every corner, and a bunch of chain restaurants and hotels. With that said, you can still find some great local attractions and ultimately the atmosphere offer more variety. 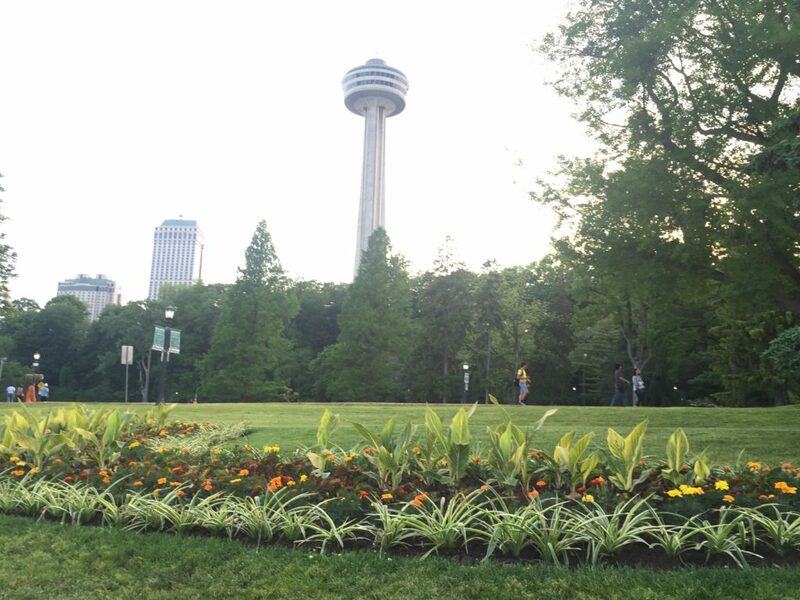 Kids will love the Canada side of Niagara Falls. There is an indoor waterpark, a Ferris wheel, a Hershey’s store, live music on outdoor patios, and a lot of family-friendly options for dining. 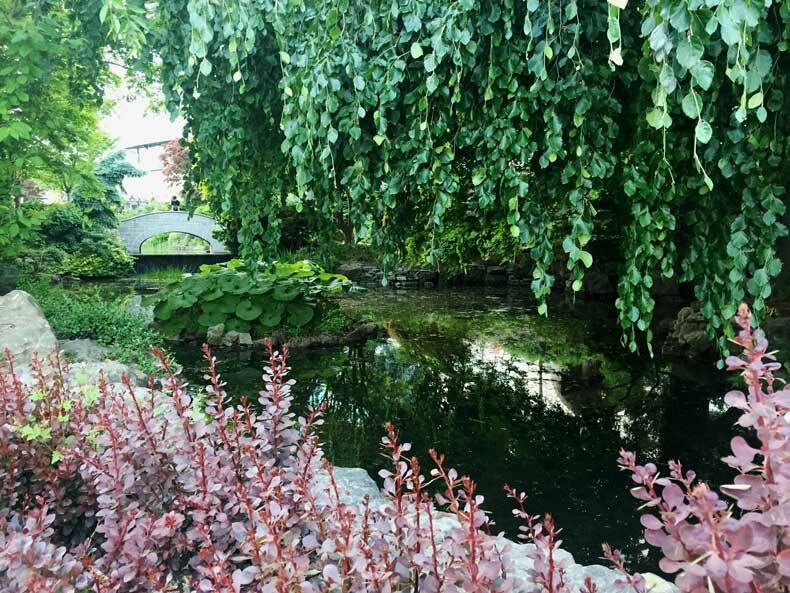 I personally loved the beautiful gardens and peaceful green spaces near the river on the Canada side. There is also a lovely walking path right next to the river and the waterfalls and a quaint park with a large grassy area for little ones to roam. I stayed at the Crown Plaza Niagara Falls Fallsview Hotel. The hotel is located directly next to the Rainbow Bridge as you cross into Canada from the US. You will actually see it on your left as you cross the border by car. The hotel is older, and the rooms are simple and small but adequate. 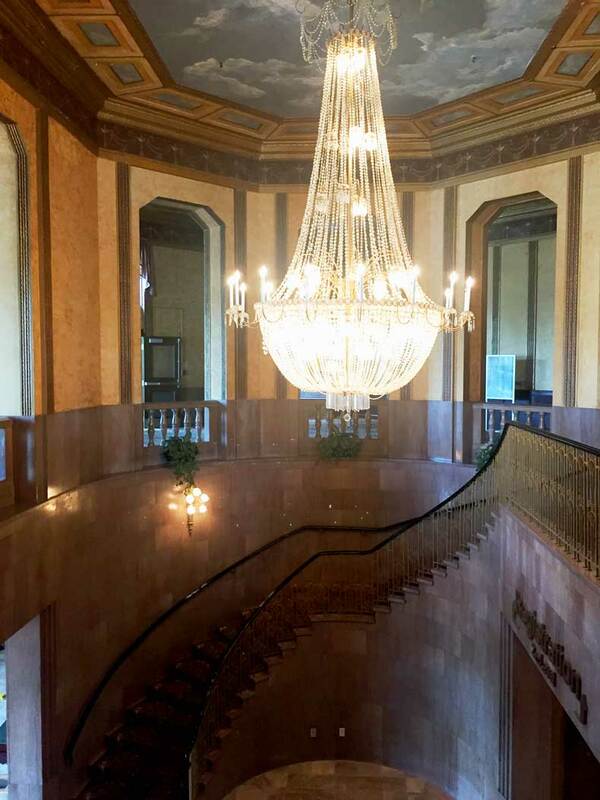 However, the hotel has a lot of charm, with an elegant staircase and chandelier in the lobby. The staff was also very friendly and accommodating. There are a few perks included in your resort fee. 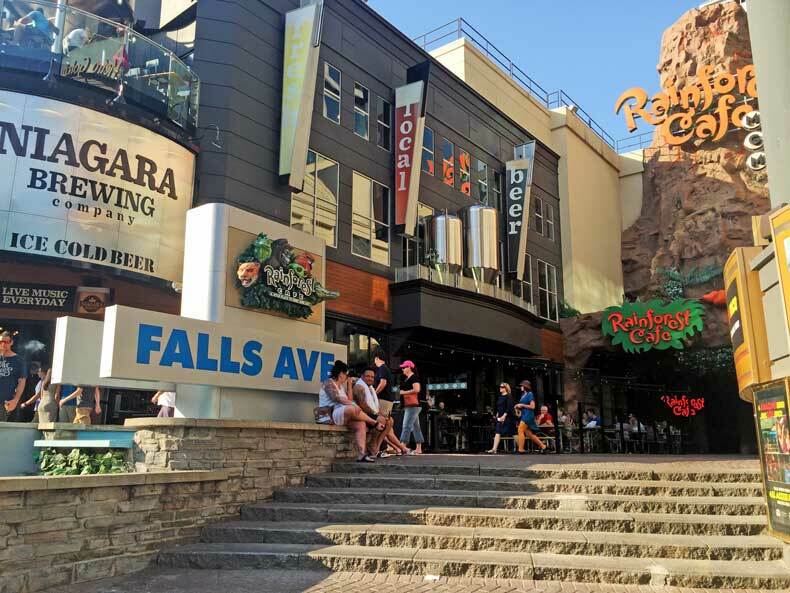 You get discounts at the attached indoor waterpark, beer tasting for two at Niagara Falls Brewery, a family picture at Hershey, and two passes for the WeGo shuttle that takes you to the tourist attractions. I did not use the shuttle, as it wasn’t that far of a walk to the waters edge and the weather was nice while I was there. You can also book a room with a view of Niagara Falls, which is especially great on weekends when they light off fireworks over the American Falls. I chose to watch the fireworks, which start at 10 p.m., from the crowded walkway next to the falls. Even as a woman traveling solo, I felt perfectly safe doing so. But if you’re tired or don’t want to fight the crowds, the fireworks are quite visible from the hotel. COMPARE HOTELS AND FIND THE BEST RATES HERE. I wanted to experience something a bit more local while I was there, so I stopped in at Niagara Falls Brewing Company for a late lunch/early dinner. They brew their own beer, and have several different types from which to choose. There is also a nice patio where you can sit and listen to live, acoustic music. The service was wonderful, the entertainment was great, the food was good, and the beer was cold! I even purchased a few beers to take back with me for my husband, who is a serious connoisseur of craft beers. Niagara Falls American side vs Canadian side verdict? 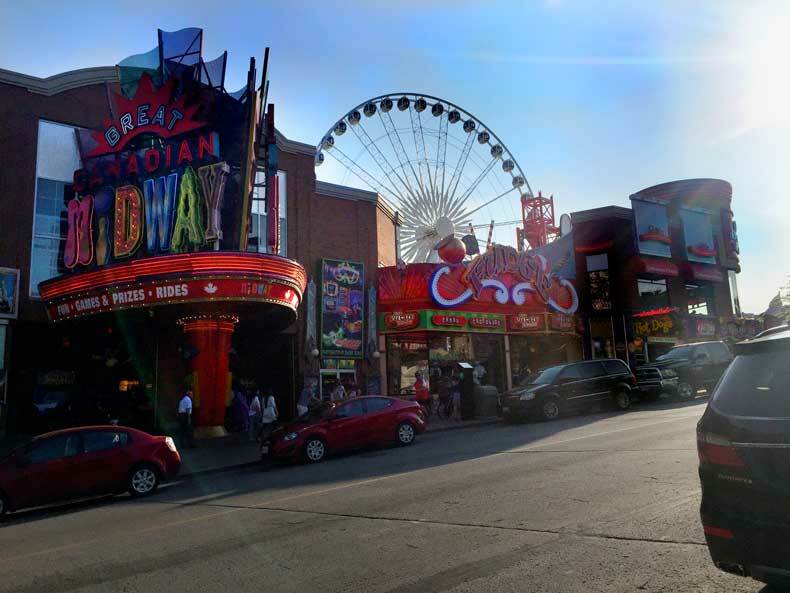 If I had to chose between the two sides of Niagara Falls, I would stick to the Canadian side solely because there are more options for entertainment, dining, and leisure activities around Niagara Falls. However, I think both sides offer something unique. The actual waterfalls were impressive. 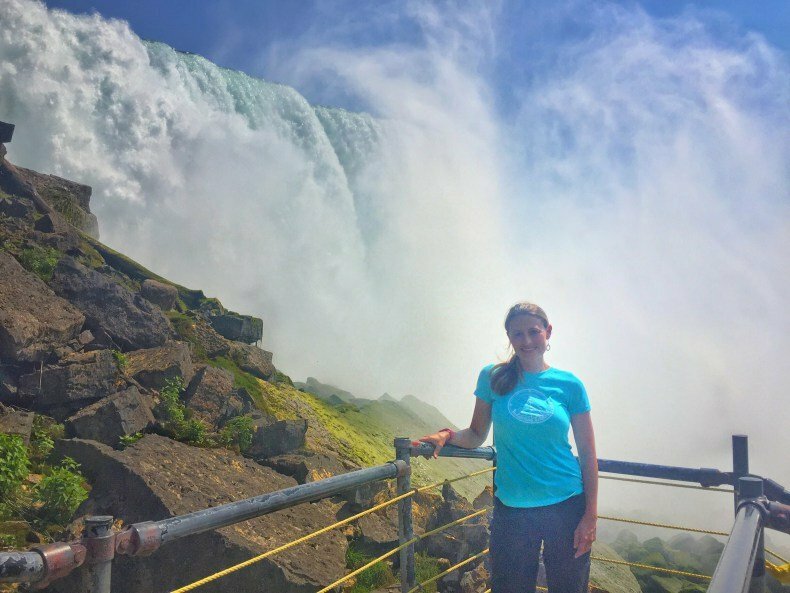 I had imagined them taller, but it isn’t necessarily the height as much as the sheer amount of water and power cascading down that makes Niagara Falls one of my seven wonders of the United States. Overall, I would say it is definitely worth a visit! Have you been to Niagara Falls? Leave us a comment and let us know what side you prefer to visit! Never been here but desperately want to visit!! Great post and some great tips – hopefully I’ll be able to use them in the not too distant future. I noticed most of the people there were from different countries other than America. I didn’t realize that Niagara Falls had such an international draw. Definitely check it out someday. It is quite impressive. Hi, I just came across this post. Thanks. Very informative. I’m planning to travel solo to Niagara Falls this September (Labor day weekend – I’m sure it’ll be crowded). Planning on doing both sides as well. I have a few questions, did you stay in NY at all? Or did you just spend the day on the NY side and drive into Canada? I was initially thinking Fri and Sat in NY, Sat – Mon in Canada but now thinking it might not be worth it to stay in NY and just spend the day (Saturday) in NY and get to Canada that night. P.S. I’m driving in from CT.
Also do you have to cross the Rainbow bridge as part of the travel or is that a separate attraction? Thanks again for you post. Made me even more excited for my trip. Yes, I did stay in New York for a night or so, however, I just stayed in a budget-friendly hotel by the airport because I had to catch an early morning flight. Buffalo is a pretty town. I went to Anchor Bar, which is the home of the original Buffalo wings. I also walked around downtown and went to a somewhat trendy area called Elmwood. I did not get to see any other parts of New York during my stay. I crossed the border at the Rainbow bridge, but there is also a pedestrian-only part of the bridge that you can walk across. Hope this helps, and have a great trip! 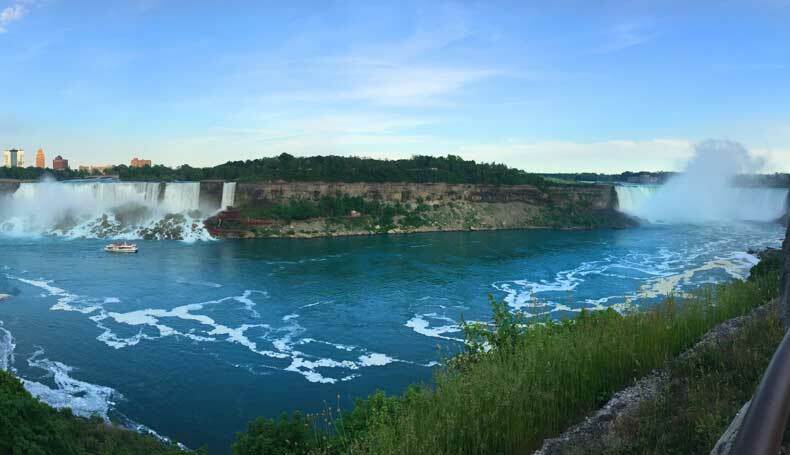 I have only ever been to the Canadian side of the falls and just went back last summer with our kids after not having been there since I was a kid. The falls outside Quebec City are actually taller than Niagara Falls but Niagara Falls are more powerful. Also there are many smaller waterfalls not too far away in Hamilton that are worth checking out too. I’ve heard about the falls in Hamilton but have never checked them out. Thanks for the tips!